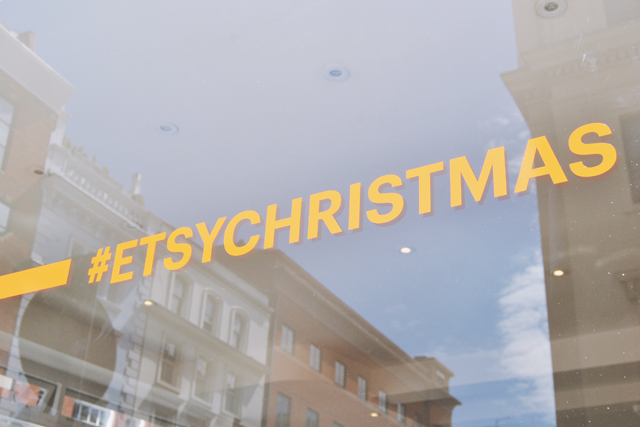 It's July, it's baking hot outside, and I just wrote the word Christmas. Seems crazy, I know, but the media is 6 months ahead, so July marks the beginning of Christmas press events. 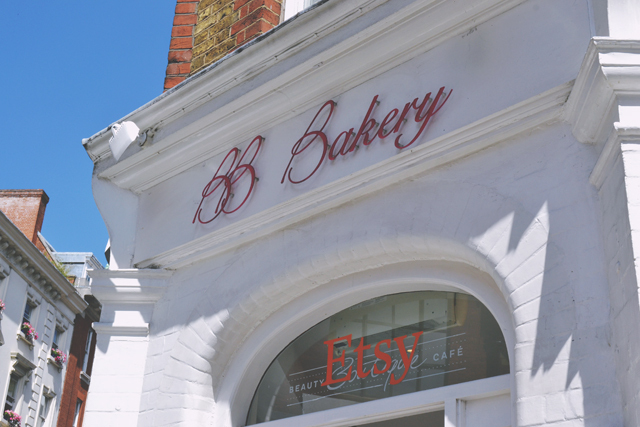 This week, I've been lucky enough to attend two Christmas events, the first of which was the Etsy Christmas Cafe at BB Bakery in Chando's Place, Westminster. 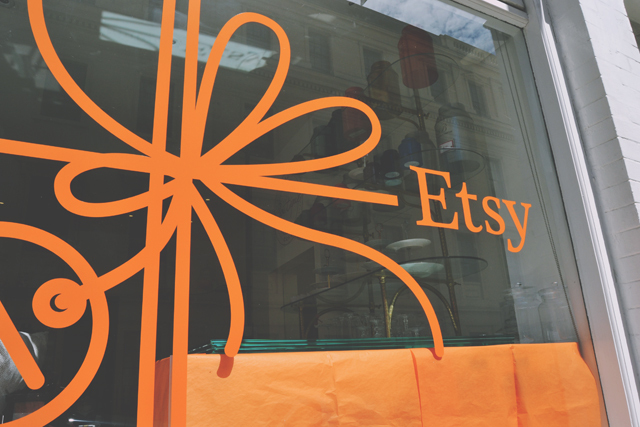 Etsy had taken over the bakery, giving it a special festive makeover and filling it to the brim with 14 of the top UK Etsy sellers showcasing their Christmas items. It was a wonderful opportunity to not only discover some gorgeous items, but also to have a chat with some really talented people. The location was perfect. BB Bakery is somewhere I've passed- and pressed my nose up against the window of- many times, as it's just off Trafalgar Square and opposite my favourite branch of Nando's (It's Nando's, in Charing Cross, and the street is called Chando's Place. Charing Cross + Nando's= Chando's! You have no idea how much this pleases me!). However, I'd never actually been inside, so this was the perfect opportunity. 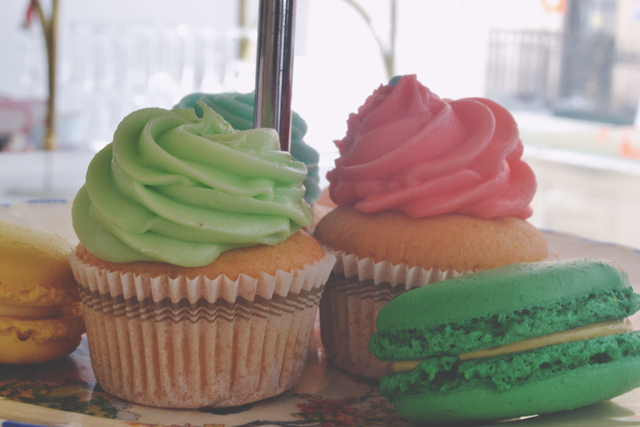 Being a bakery, there were cupcakes and macarons galore. Delicious, delicious goodies. I was very sensible and managed to resist going overboard, although this particular macaron did leave me with a bright green tongue! Of course, I wasn't there to eat cakes and confectionaries. Come on, this is work, guys! I had networking to do. 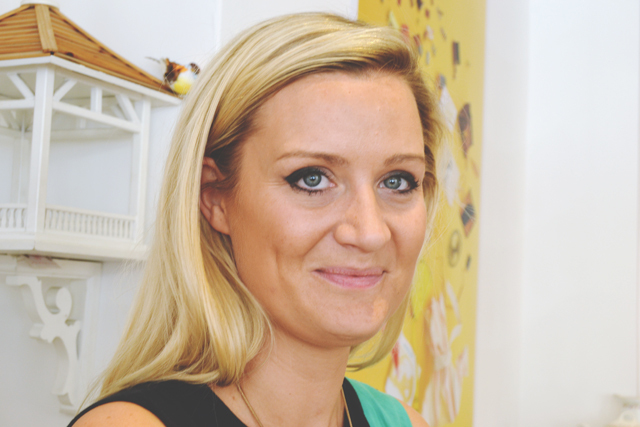 I started by chatting to the very lovely Alice Tams of Birds in Hats. Her Etsy store, unsurprisingly enough, is dedicated to illustrations of birds in hats. Sounds strange but works so well! The baby penguins were my favourite by far. 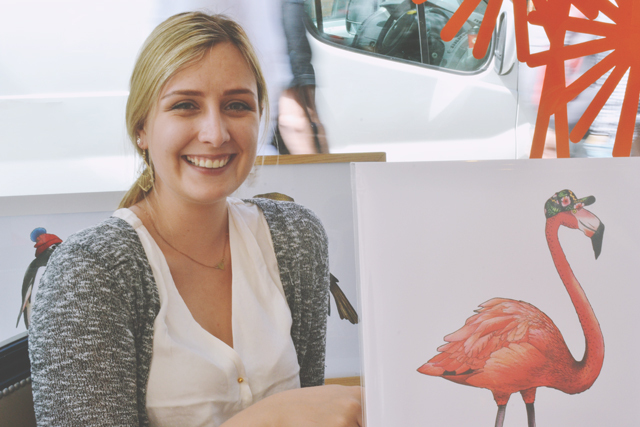 Alice told me that she is always very careful to use a range of reference material so she can make her illustrations as accurate as possible, and once even drew a budgie from life! Next up was Helena of PomPom Needlepoint. I'm really into modern embroidery at the moment, and have been thinking about taking up the craft, so I was really interested to hear about her embroidery kits to create your own cushion cover. 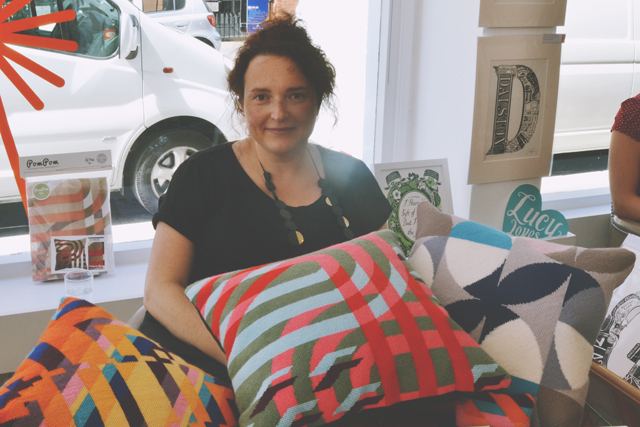 When made up, the cushions are really durable and they're a real labour of love, as they can take months to complete. It really makes you think about the process behind the designs. 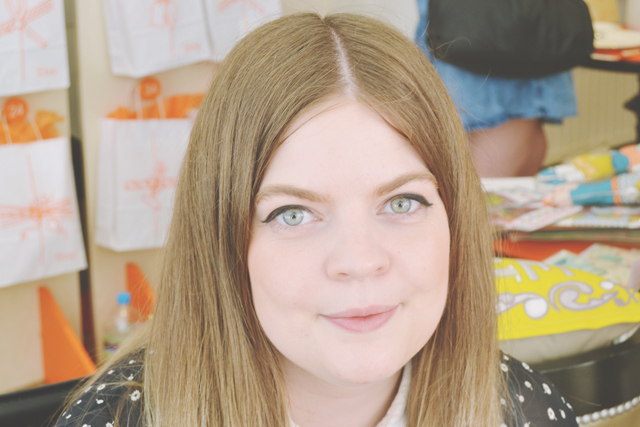 I was drawn to Luce of LucyLovesThis because I love anything initialled. Having a name like Becky (not Rebecca) meant I never got anything with my name on it as a kid, and had to settle on just a B. As a result, I have an overwhelming love for anything with a B on. Each letter represents an area in London, illustrated with landmarks from that borough. 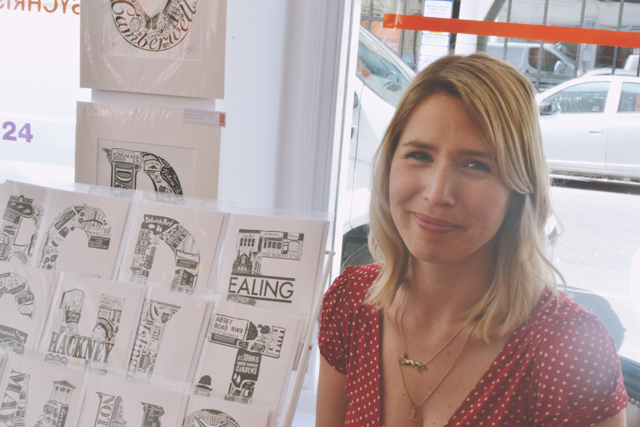 However, Lucy is also expanding outside of London, with the likes of Brighton, Manchester and Leeds prints. Unfortunately, I didn't get a clear shot of Tatiana, the lady behind We Are Arrow, so I've borrowed the above photo of her bobcat necklace. 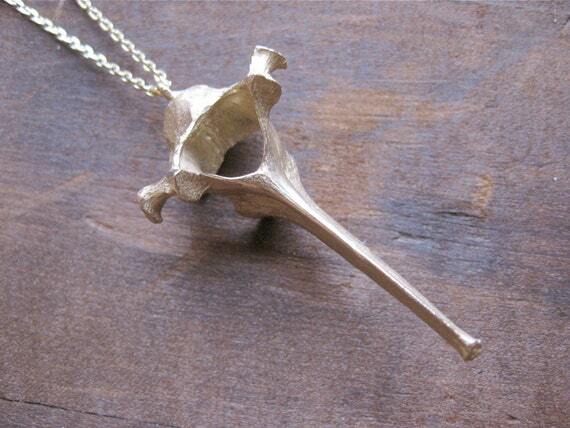 All of her jewellery is cast using a wax mould based around organic matter found in nature. 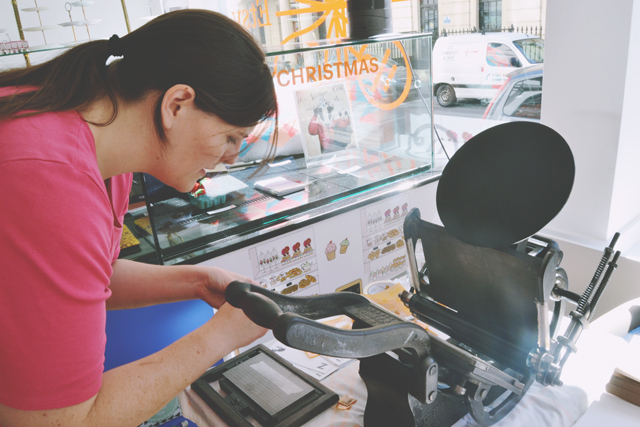 She gets inspiration from all over the world, even collecting corn in Greece to create beautifully intricate bracelets. 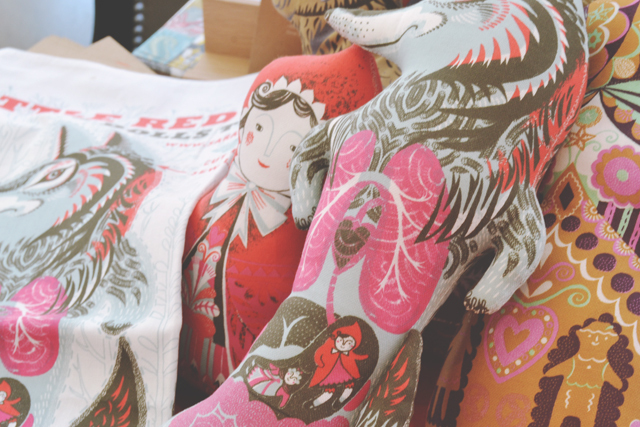 Sarah Young sells adorable tea towel doll kits. Just cut out the figures on the tea towel, fill with stuffing and sew together. Simple! I love the slightly dark humour in them, like Little Red Riding Hood squished inside the wolf's stomach! 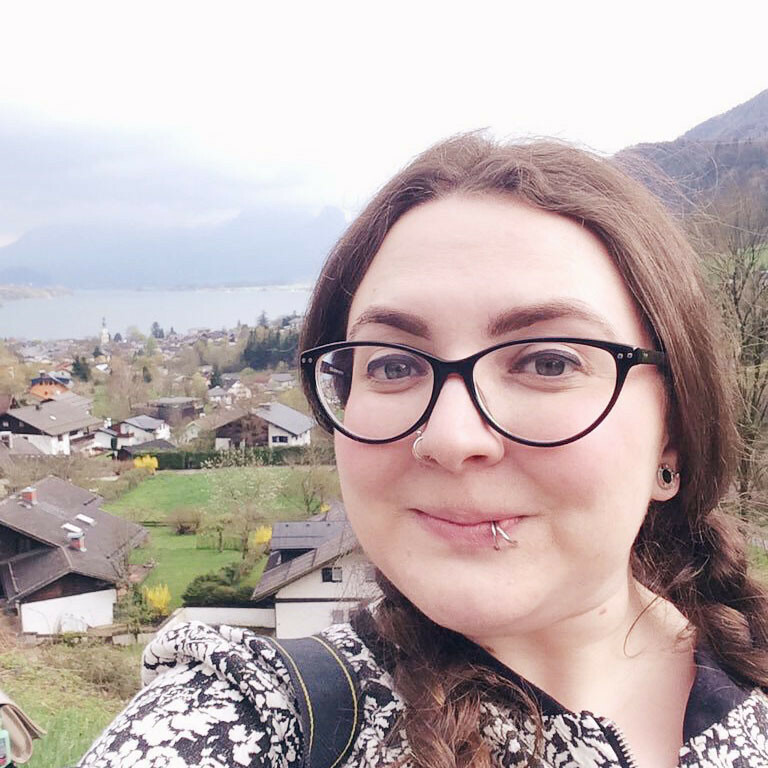 If you're into wry humour, you need to check out Yvonne Ellen. Her vintage teacups, emblazoned with words such as "rum" or "gin", are each created from vintage china, so every piece is unique. I loved the juxtaposition of the dainty cups with the ironic humour. Yvonne Ellen also stocks quirky animal-printed crockery that creates a complete design when main and side plates are laid correctly. It was very exciting to see Zoe of Ladybird Likes at the event, as we already followed each other on Twitter and had seen each other around online before. As well as her trademark quirky designs, Zoe has introduced some more simplistic, sophisticated pieces, which still retain the kitschy quality you'd expect from Ladybird Likes. Did you know that the banner necklaces were originally inspired by a wall hanging? 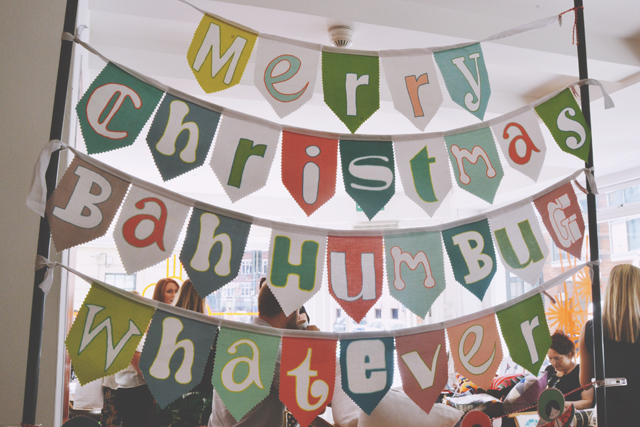 How could I be anything but attracted to his colourful, carnivalesque banner from Cecily Mae Handmade. The tongue-in-cheek grumpiness may be at odds to my omgchristmaschristmaschristmas approach to the festive season, but I love the sense of humour. 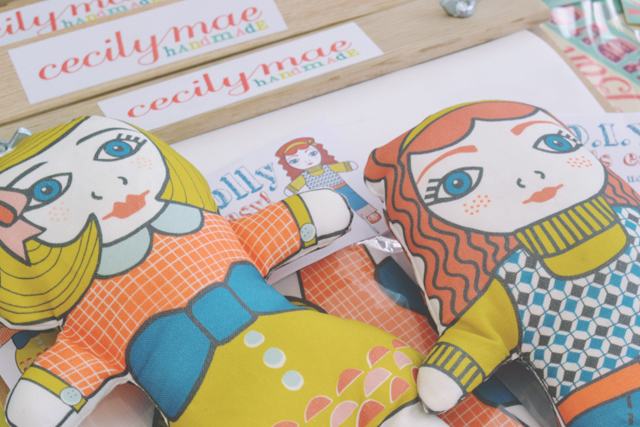 As well as the banner above, and matching Christmas cards, Joanna- the brains behind Cecily Mae- sells DIY doll sewing kits, cushions and absolutely stunning papercuts. Although they're incredibly intricate, they're surprisingly stable and secure. Throughout my visit, my attention was grabbed by the bright neon of the items from Neon London, run by Sophie. If you're a neon fan, you will love this shop. Most items are hand painted using neon paint, and I was particularly interested by the candles. The paint doesn't shorten the burn time at all, it just curls inwards and burns away. What a great, modern look to find under your tree on Christmas morning! To be honest, I got a bit excited when I saw the Biscuit Bandit plate at the stall of JimBobArt. Unfortunately, the artist behind the designs, James, wasn't at the event, so I ended up talking to a lovely man whose name I've completely forgotten. Our mutual love for, frankly underrated, malted milks sparked a biscuit-related conversation and I'm afraid I forgot to ask anything about the business. 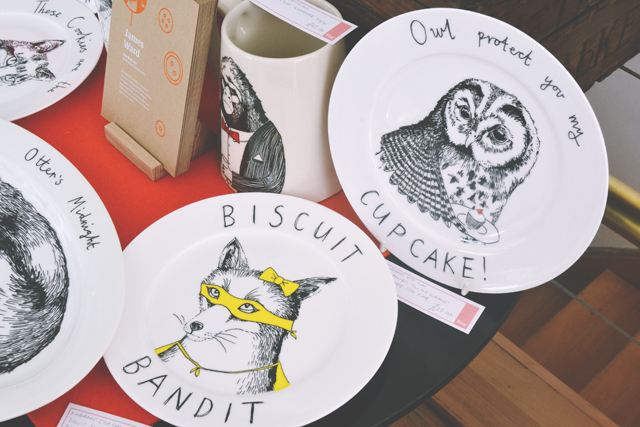 Still, the designs are amazing and I really think I need a Biscuit Bandit plate in my life! Finally, I headed over to Cayce, the creative genius behind Cerulean Press. 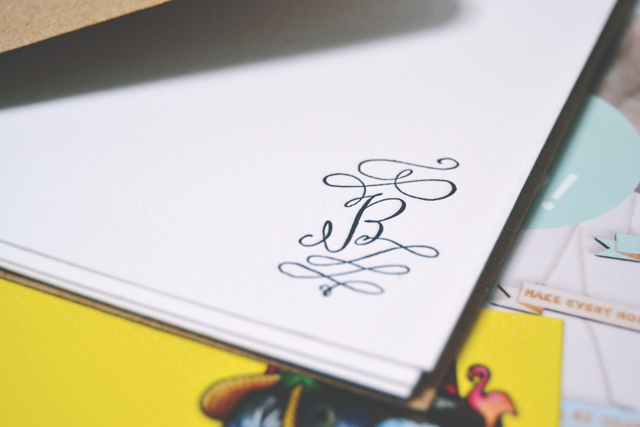 This was very exciting to me because I got to print my own monogrammed notecards. Remember how I said I loved anything with initials? I could choose from three designs (I naturally went for the fanciest one), Cayce prepared everything, and I pushed up the letterpress. I felt a little bit like a Victorian factory worker, in the best possible way! What do you think of my handiwork? 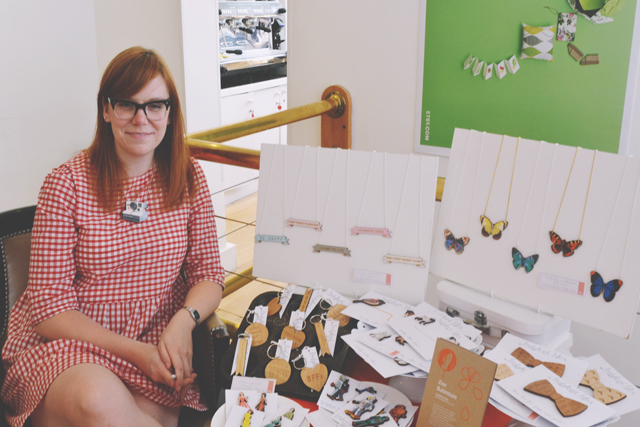 The very lovely people at Etsy had a fantastic idea- a Christmas tombola! 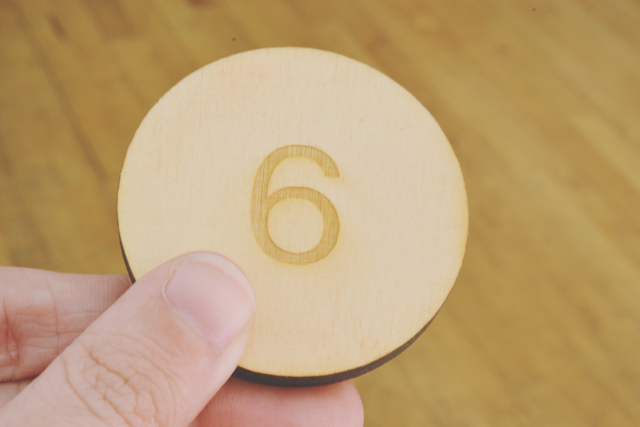 Everyone who visited the cafe chose a wooden disc from the tombola, which had a number carved into it. As you can see, I picked number 6. 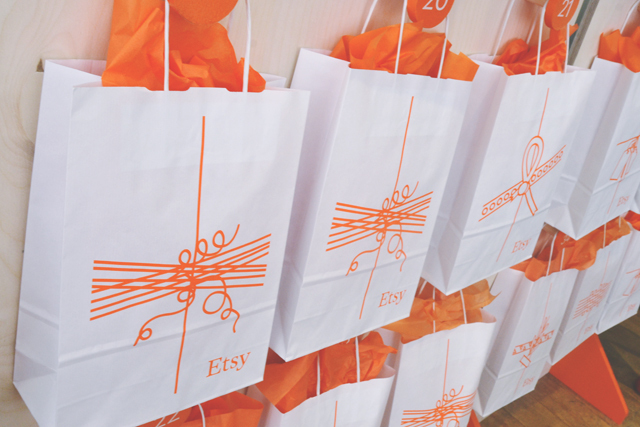 At the back of the room was a screen on which hung a couple of dozen gift bags hanging from numbered pegs. The number on my disc correlated to the bag you were given, each of which contained a different item from one of the sellers showcasing their designs. I was very excited to find that, along with a sticker and a really fancy Etsy USB stick, I'd received a Ladybird Likes Dream Big keyring. It seemed perfect, as I'd been explaining to Zoe how much I loved the keyrings. Clearly fate intervened! My time spent at the Etsy Christmas Cafe was fantastic. 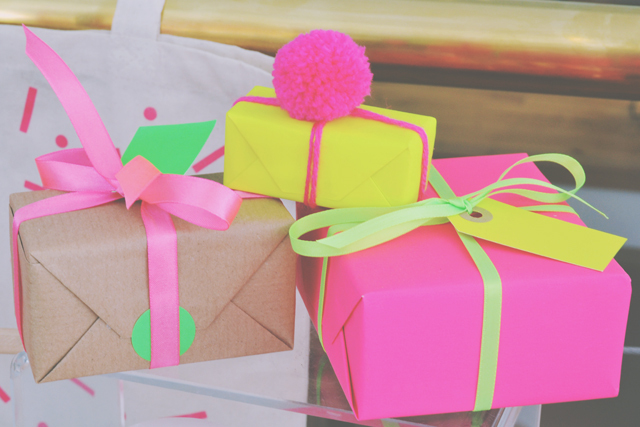 I met so many amazing new people and have a huge amount of inspiration for gift giving this year. 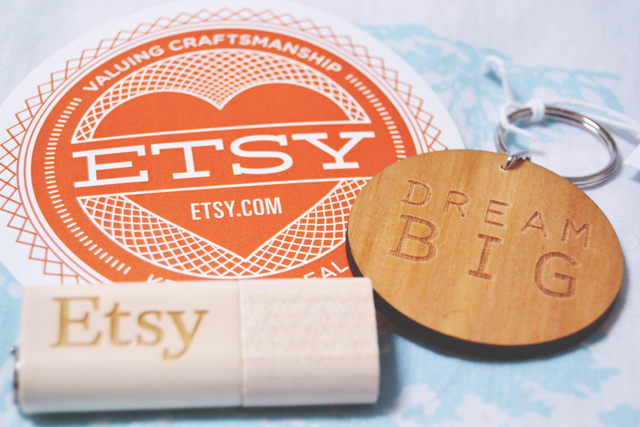 A huge thanks to all the sellers I spoke to, BB Bakery and, of course, Etsy themselves for such a fun afternoon! That pun made me laugh so much! What a wonderful meet up of crafty ladies! That must be so frustrating! I always got Rebecca, which is horrible because my name's not Rebecca! Ah this event looks amazing! Unfortunately for me, it was held on my birthday so I couldn't go. Boo! I would've loved a chat with Zoe. I adore that woman. I hope you had a lovely birthday! Shame you didn't get to come along to the event though. I love Birds in Hats!! Alice is SO lovely, not that I've ever met her but whenever we've chatted she's so nice. 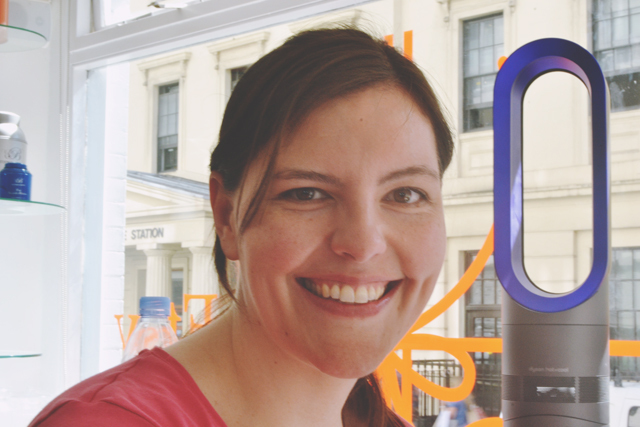 You'll be glad to hear Alice is really lovely in person too! Looks like a great day :-) I love the tombola idea! It was such a unique idea! I was invited to this and would have loved to come but unfortunately it was only a couple of days before so I had no time to book tickets cheaply! Some of these shops look awesome... off to check them out now. I'm glad you had a great day!